The Myth-Sud Sathorn, is a boutique hotel in the area with perfect location only 1 minute walk from BTS Saphan Taksin Station. Thus it is very convenient to take any kind of transportation. You can reach Skytrain station, bus stop, Express boat pier where you can take boat to Grand Palace and free shuttle boat to Asiatique The Riverfront (the most famous night market), Robinson department store, 7-11 within only 1-2 minutes walk. You can also reach Hualamphong train station (train station to everywhere in Thailand) and China Town within only 10 minutes by bus. The hotel is a 35-minute drive away from Suvarnabhumi International Airport. Street hawkers are everywhere in our area you can always find things to eat 24 hours. 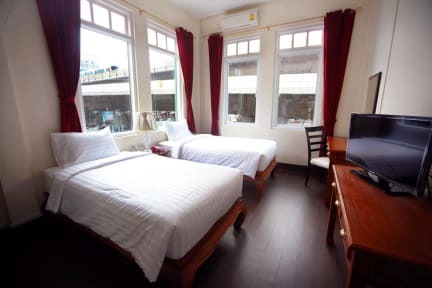 As the hotel is located in historical area, tourist attractions are only within walking distance The old custom house, Bangrak market (famous food location), Yannawa Temple, Assumption Cathedral, Haroon Mosque, etc. Free Wi-Fi internet is available in all area. All furniture is carefully selected and made to order by using Teak wood from Chiangmai. (the best teak wood location in Thailand). Flat-screen TV, Cable Channel, refrigerator and amenities are provided in every guest room. Enjoy our homemade breakfast which made of local product in the area. Fresh fruit & vegetable grow in our garden will be served to you while listening to the morning bird sings in the middle of Bangkok. The Myth building is restored from a legendary building which was established on Sathorn Tai Road almost a hundred years ago. 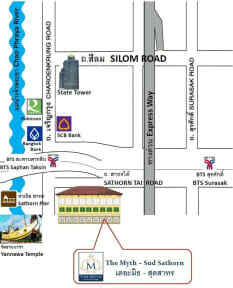 We are one of the very first buildings on this historical Sathorn Road. Whilst other buildings are transformed into skyscrapers, we have tried our best to preserved it and handover to the next generation. 1. Check in from 14:00 and check out until 12:00 noon. (1) If guest would like to have early check in, they can inform us via the email. (2) For late check out, customers can request upon their arrival when they check in. (1) At least 7 days advance notice before the arrival date is required for cancellation free of charge. (2) If cancelled later or in case of No-Show, 50% of the total amount will be charged.